The Condiment Bible: Boycott Nathan's Hot Dog Eating Contest!!! 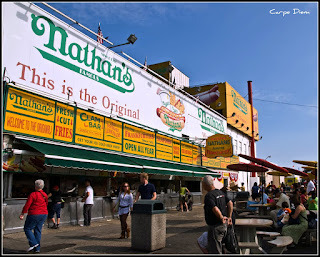 Boycott Nathan's Hot Dog Eating Contest!!! Every Fourth of July, I cheer wildly for USA's Joey Chestnut to beat the piss out of Takeru Kobayashi in the Nathan's Famous Hot Dog Eating Contest. Eating a hot dog with no condiments should be a crime. Write your legislators! Even the Nathan's logo has an inspiring strip of mustard! Note: OK, OK, so I'm still watching...and cheering for Joey to reenact WWII (Kobayashi has retired! )...but under protest. Plus, I respect the event's vuvuzela ban.